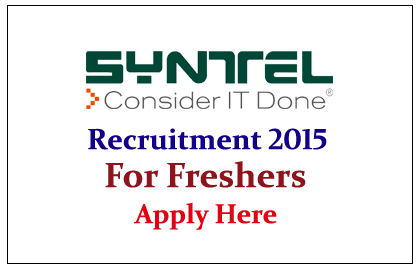 Syntel is hiring Freshers for the year of 2015, location will be anywhere in India. Eligible candidate can apply here, for more details check below. 1. Good written and verbal English Skills. 2. Flexible to work in any shift (Morning/ Afternoon / Night). 3. Candidates who have applied in the past 6 months are not eligible, to re-apply. Eligible candidates can Register via Online. Shortlisted candidates will call for direct interview.